Provincial Grand Master of South Eastern Counties. Thomas Andrews was born in Armagh City on the 9th February, 1844, the son of Jeremiah and Martha Andrews. He was baptized on 20th April, 1844 at St Patrick's Cathedral in Armagh. He was educated privately, presumably by visiting tutors. Little is known of his early career. He was in Waterford in 1872. By 1874, he was an accountant there, living at 10 Barker Street. Barker Street ran below the walls of Ballybricken Prison, Waterford's main gaol until it was abandoned in 1939. By the end of 1874, Thomas had entered the prison service, and described himself on his daughter Martha's birth certificate as Deputy Governor of Waterford Gaol. According to the Valuation List, he occupied 17 Barker Street from 1873 to 1882. According to a book of Cork biographies dating from around 1910, he was appointed to the post "by competition". In Harvey's Directory for 1877, he is listed as living at 17 Barker Street, and his profession is listed as "Deputy Governor of Gaols". Thomas Andrews held various appointments in various gaols until on the 13th July, 1892, he was offered the governorship of Cork Male Prison. He replied the next day, accepting the post. His salary was raised to that of a First Class Governor, namely, £320 a year. He remained Governor of Cork Prison for eighteen years. The family lived in "a fine house within the prison wall, with a lovely garden." Under the 1909 Prisons Act, he sought to remain as governor after his 65th birthday on grounds of "good behaviour", but was turned down. On 19th February, 1910 his superannuation terms were settled, and on 1st March he was asked to hand over the prison to "Mr McGann" from Kilmainham. He finally retired on 7th March, 1910, and was made a Justice of the Peace for the County Borough of Cork. 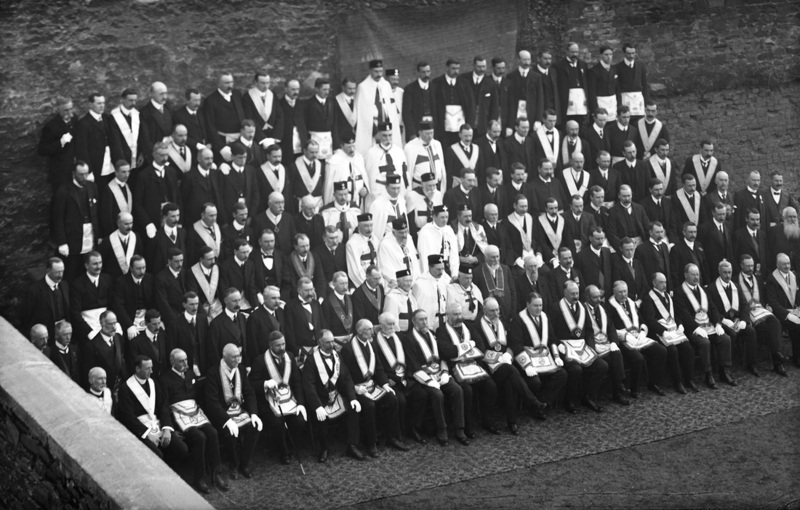 A gathering of various branches of the Masonic Order at Waterford on the 21st October, 1910. The photograph includes members of the Craft, Royal Arch, Preceptory and Rose Croix. R.W.Bro. Andrews is sitted in middle of the front row with his hands crossed on his lap. Thomas joined Masonic Lodge No. 32 in Waterford in 1872. He received his Entered Apprentice Degree on 7th August, 1872, his Fellow Craft Degree on 11th September, 1872 and his Master Mason Degree on 26th November, 1872. He was Worshipful Master of the Lodge in 1876. He took part in Lodge activities at Clonmel (Lodge 44), presumably while he was there between 1889 and 1891. He formally joined Lodge No. 3, Cork, on 2nd October, 1897. He was also a governor of the Masonic Girls' School in Ballsbridge, Dublin, for over thirty years. Thomas died on 7th October, 1921 at the Bon Secours Convent Hospital in Western Road, Cork, close to the prison where he had worked for so long. He was buried at St Finbarr's Cemetery. erected by his loving wife sons and daughters."